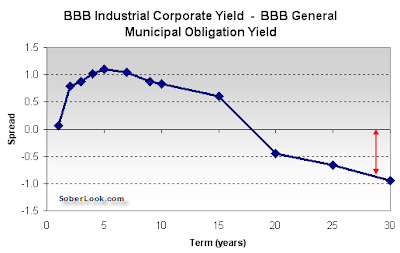 Even with the advantage of paying tax free interest, municipal bonds in many instances are yielding more than their corporate equivalents. Bloomberg: State and local governments that sold $43.8 billion of taxable Build America Bonds this year will pay $385 million a year more in interest than similarly rated corporate borrowers, based on data compiled by Bloomberg. The spread between corporates and munis varies along the yield curve. In the short end the tax advantage keeps the spread (corporate yield minus muni yield) positive, but for the longer maturities the spread reverses. This means that in spite of the tax advantage of municipal bonds, given the choice between two equally rated long duration bonds with the same coupon, investors prefer the corporate paper. Clearly unlike corporate bonds, munis have lower analyst coverage and are viewed as a specialty market. Buyers of longer-term munis tend to be specialized muni funds, while corporate paper is held by institutional investors, fixed income funds, etc. The reason given by Bloomberg is poor transparency of municipal issuers. But other reasons include the deterioration of state budgets and the risk that in the long run munis may lose their tax-free status at the Federal level. But there is something else. Private investors continue to be nervous when dealing with governments as political risk enters into the picture. Who is to say that 10-20 years down the road, municipalities will not walk away from their obligations. There is only so much pain that angry taxpayers in various states may be able to take. And for now that risk is costing municipal issuers the extra spread.